Performed rather than narrated, this remarkable audiobook will entertain and inspire as it draws you into Morgan Hill’s journey to discover her authentic self. Wearing a pair of spectacles she finds hidden in an heirloom trunk, Morgan begins to catch a glimpse of lost generations and long forgotten family secrets. Her expansion and awakening flourish when she meets Yuri Bozek, a mysterious lumberjack who is more than his occupation implies. Drawing on intuition and deep energetic awareness, Yuri guides Morgan on a journey to discover the true essence love. Their paths converge in the dark attic as the heirloom trunk exposes ancient bonds neither could have imagined. 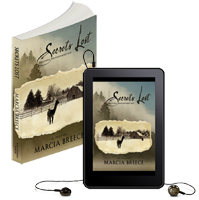 Set on a llama farm in rural Western Washington, Secrets Lost is a gripping story of self-discovery and new beginnings somewhere between Celestine Prophecy of the 90s and Baby Boom of the 80s. It might be considered a guidebook to help you crystallize your own perceptions of life and authenticity. Independent bookstores can order Secrets Lost via Ingram or Baker &amp; Taylor.